In addition to the sense of continuity that a family-run business offers, we love the fact that we get to partner with so many different shipyards and owners around the world. Every yard has its own modus operandi, something that has proven hugely inspirational while also providing us with the broadest possible knowledge base. 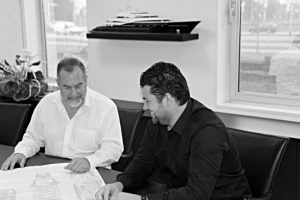 While holistic design is our forte, we’re equally happy to partner with another exterior design company and provide just the naval architecture for the project, or to style and design a yacht for a yard which already has naval architecture capacity in-house. However you choose to keep us busy, we see our work more as a vocation than an occupation. This is our life and we’re all in it together as a family.